Winter is a fun time for The Powers Pack. The dogs and I just love transitioning from dryland training to running on groomed snow covered trails. 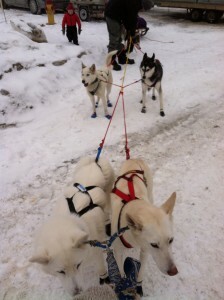 This year our first run on snow would actually be a snow race run by the Maine Highlands Sled Dog Club. 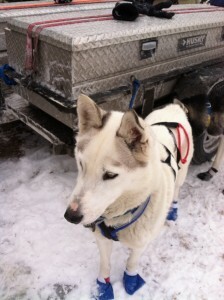 The Brownville-KI And Beyond Sled Dog Race is an annual event held in Brownville Maine. The purpose of the race is to promote the sport and this year there were two mid distance races being offered–a 30 miler and a 20 miler. 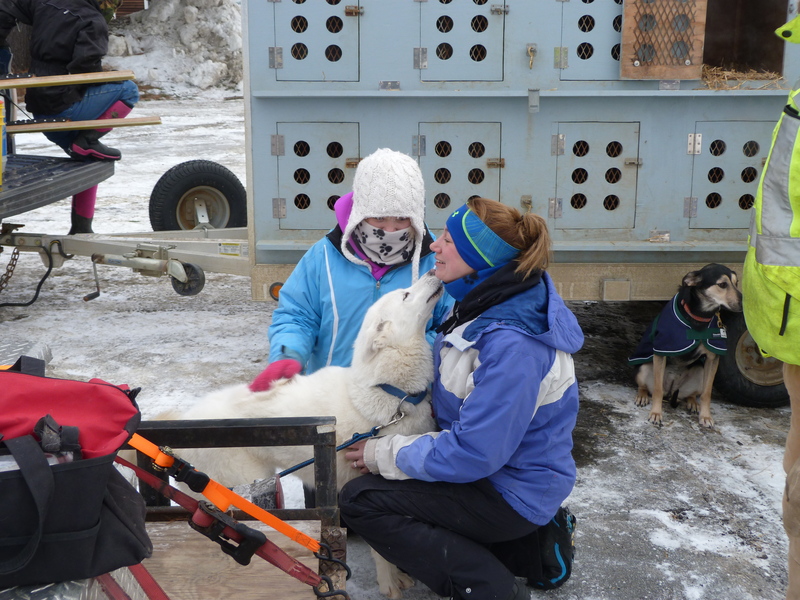 There was also a Fun Run category meant to encourage new mushers to try their hand at racing in a very friendly atmosphere. The organizers of the race and the club administrators are very supportive individuals who embody the philosophy of the club which is to educate people about the sport of mushing. It’s because of them that I felt very comfortable taking part in what would be my first 20 mile sled dog race. It would also be my first time on snow this season since living in Maryland does not afford me any opportunity to train on snow. So this race would really be a training run for me and I could hardly wait to get out on the trail with my team. As it turned out conditions on race day were perfect! Temps were in the low 20’s and there was a light snow fall all day. 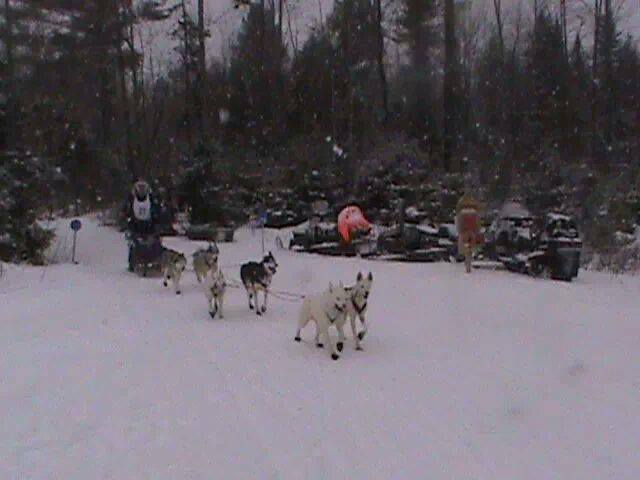 The trail, a nice flat former railroad bed, ran along the river which provided mushers with lovely winter scenery. What a great way to start our winter snow training! Here is a guest post from my husband and One Man Pit Crew, Kevin, and how race day looked from his point of view. We’re in Brownville, Maine, for a twenty-mile race, having made it up the East Coast despite 35mph winds, snow, and Governor Christie trying to cone off one lane of the Tapanzee Bridge. The Head Musher says it wasn’t Christie but it’s hard to mistake that profile, especially when it’s clad in a spandex exercise suit. If he denies it on Monday morning then I’ll know I’m right. We make intermediate stops in Niantic, Connecticut, and Lewiston, Maine but manage to make it to Brownville in time for the Head Musher to do a three mile practice run on snow Friday afternoon. 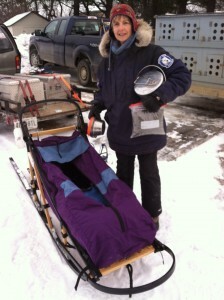 Virtually all of her training runs thus far this year have been on dry land with a three-wheel cart. The one exception was an early morning training run on the beach at Assateague National Seashore on a snow sled outfitted with skis. This turned out to be a good idea that needs work. We’re staying in our usual cabin in Milo, Maine, (Pop 2,383) Brownville’s (Pop 1,259) twin city. The floors are heated. 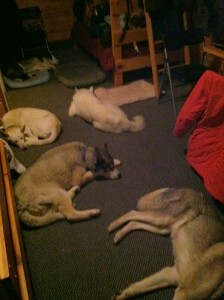 The dogs love the place, as you can see from the following picture. They are usually looking for a sunbeam and you gotta wonder what they are thinking about heat that comes from below! Race day begins at 6:00am with dog feeding. 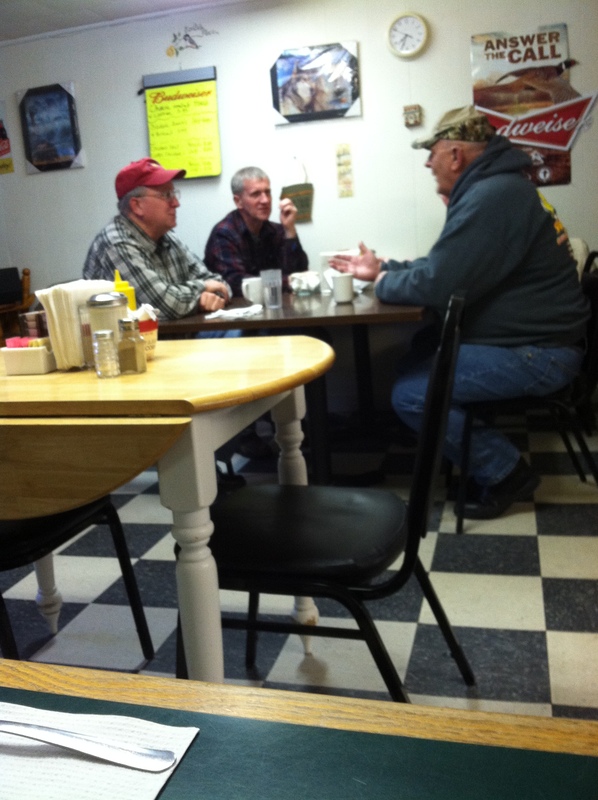 At 7:00am, human feeding begins at the local general store which, interestingly enough, is called “The General Store…and More”. The “more” includes “Live Bait”, hunting and fishing licenses, a laundromat, a recycling facility, gas pimps (oops, make that pumps) and a small restaurant seating ten. I’m convinced that hidden somewhere is a mortuary and a barber shop. Meanwhile the Head Musher is trying to alter the L.L. 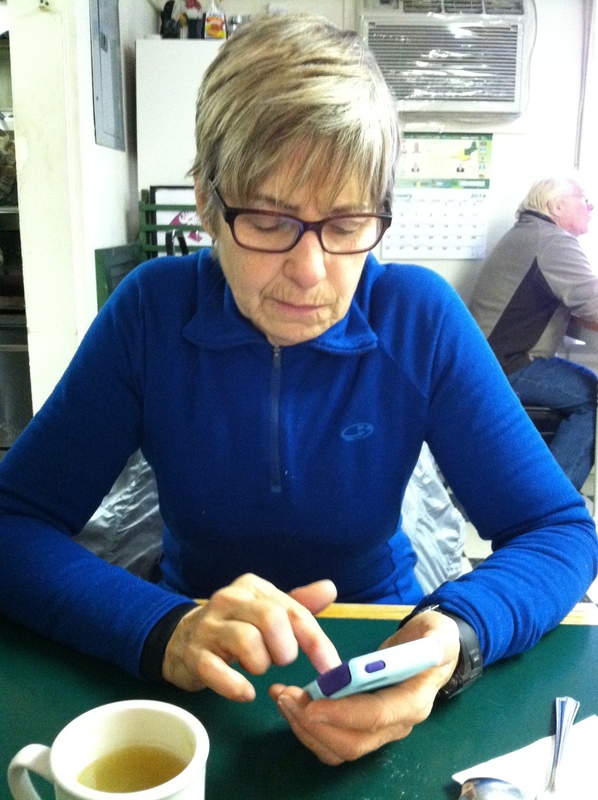 Bean unit pricing system by hacking into their database using her brand new iPhone 5c. Her index finger is going to be worn down to a nub by the end of February. By 8:15 we’re at the race site. We’ve maneuvered our cah into the appropriate pahking slot, take the sled off the roof, and begin to prepare for a visit by the Race Marshal, our good friend Gary Chapman, who will check to make sure the Head Musher has the necessary gear (hatchet, sleeping bag, fire starters, emergency food for herself and the dogs) to survive in the wilderness should she somehow get lost and end up in a wilderness different than the one she is supposed to be in. She passes with flying colors largely because the Race Marshal himself loaned us most the stuff that she needs. 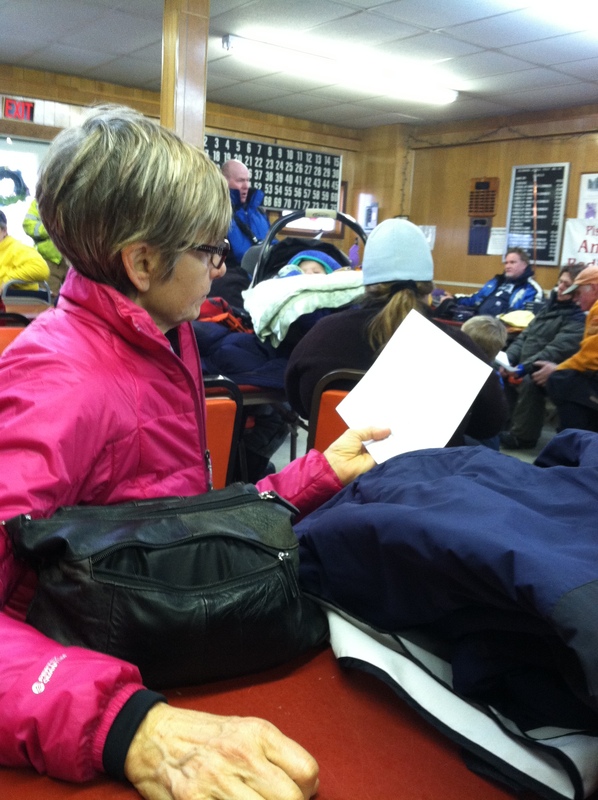 Here’s the Head Musher studying the map so that she doesn’t end up in the wrong wilderness and have to use her emergency fire starters to alert the Maine National Guard helicopters of her whereabouts. At the end of the session, there is a question and answer period and, predictably, the very first question is about something that was covered during the previous thirty minutes. I’m beginning to think that this is an ironclad rule of question-asking in any context. Then it’s time to head back out to the car. 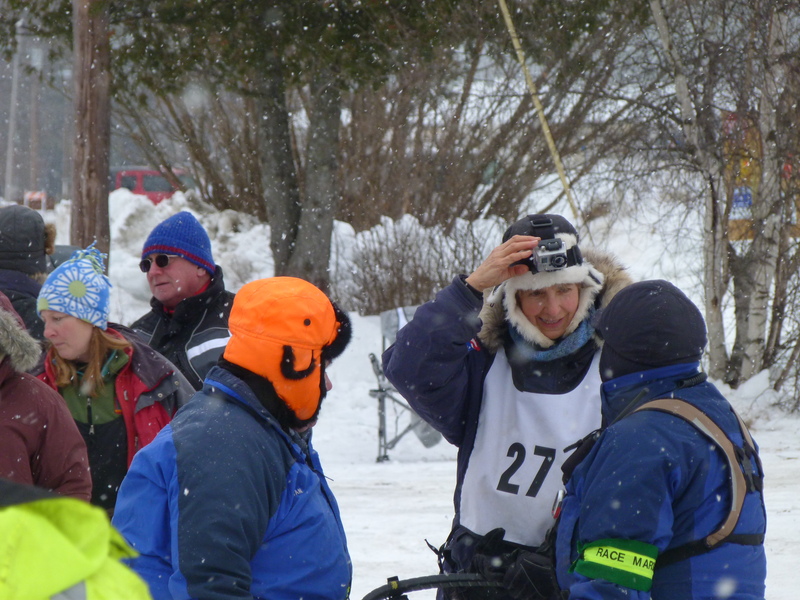 The Head Musher’s group (carrying bibs numbered 21 through 28) tees off (oops, I mean heads out) at 10:30am at two minute intervals. The head Musher is bib number “27” which means that she needs to be at the starting line at 10:42. You don’t want to miss your starting time because they make you go out last. Not only that, your timer keeps running while you’re milling around!! This is a great embarrassment that they blame on the pit crew much like they blame the caddie for a guy having too many clubs in his bag. If you’re a semi-professional at milling around in the snow as I am, you learn that the worst thing that can happen to you next to freezing to death is having cold feet for the two hours before you freeze to death. If I’m going out, I’m going out with warm feet. So, I bought these boots that mushers wear called “Neos”. They make you want to go out and stand in a puddle of ice water. 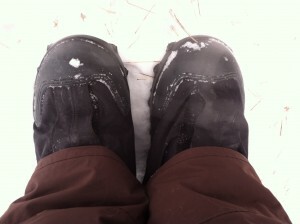 If you die of exposure and your feet turn out to be cold, they agree to reimburse your heirs the cost of the boots. While I’m milling around, various people walk by and admire the dogs. Every kid wants to take one home. Here’s Cree pretending that she doesn’t love the fact that everyone wants to pet her. When they leave, she jumps up and wags her tail as if to say: “Wait, wait. No more petting? What is this? I love petting! Come back.” Then the next fan walks up and she calms down. Look closely at this person. She’s the most dangerous person in Brownville, Maine. They should make her wear a sign that says…”Hey, listen up. I’m dangerous!” If you’re not keenly aware of the danger you could end up owning a puppy. If you succumb to the invitation to hold him, you could end up owning two! The problem is, you wouldn’t care. You’d think to yourself “I have a puppy! He’s soooo cute!” and all your friends would say “Oooooohhhhh, you have a new puppy!” The next thing you know, you’d be on a dogsled careening down a trail called “The Tadpole”, dodging tree limbs, and confronting an angry moose blocking your passage. 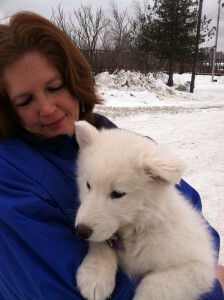 Siberian Husky puppies are the introductory drug to mushing. But on the bright side, if you ignore my warnings, you’ll end up with a puppy (or two) and the puppy will grow up and wander over to you while you’re trying to type, plunk his chin down on your leg, look up at you with those sad eyes that stare right into your soul and say “I may have pooped on the floor of your study!” Small price to pay for a wonderful canine friend. Now it’s nearing race time. The dogs are bootied, harnessed and out on the gangline. The pulling machine is ready to roll. Sable, the new member of the team is in the middle on the left next to Kodiak. 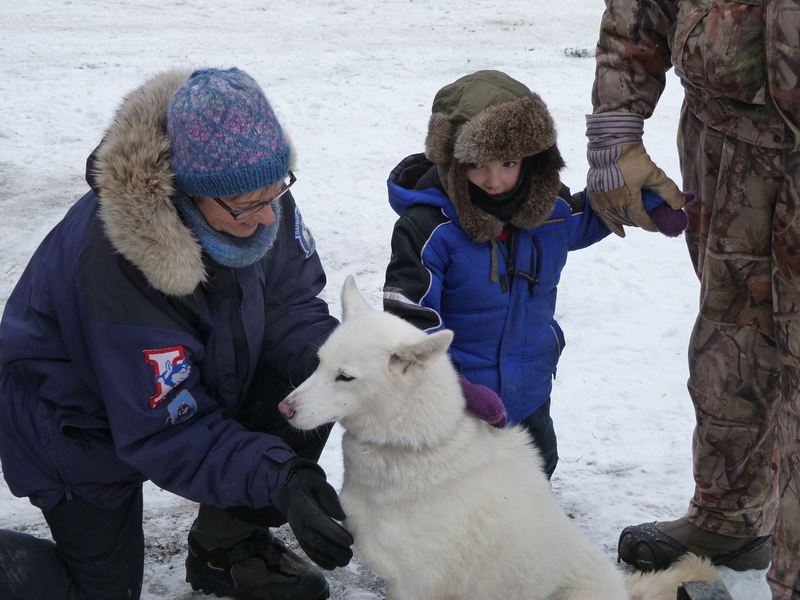 As the Head Musher leaves the chute, it starts to snow and continues for the two hours and fifteen minutes or so that she is out on the trail. The dogs do great. Their first 20-mile run of the season. It always amazes me that you can put a new dog in a team with five others and within thirty seconds they are all getting along and working toward a common goal. A lesson often missed by the human watchers. Heading for St Jacques, New Brunswick, for two weeks of training. Here is a picture taken by an observer on the trail as the team was headed for the finish line. Our goal was accomplished! We finished with smiles on our faces and tails wagging! I LOVE reading these blogs and get my husky fix just reading them. Good luck this season!! 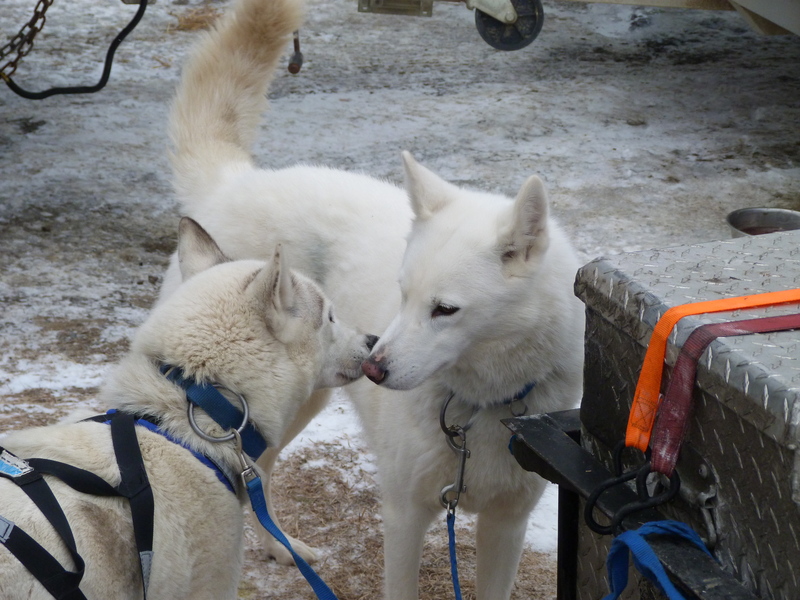 I LOVE READING ABOUT YOUR MUSHING! Happy to hear it Penny! I know I’m always going to have a good laugh at your blogs. I’ll be looking for the next one. Have fun in Canada! Glad you’re enjoying them Joan. I am having fun but it sure is cold up here!